Buoyancy and Density Lesson for K – Grade 1: Does It Sink or Float? Provide a small backyard pool, large tub of water, the bathtub or any other container that you are able to fill with water. With your child or children, gather a variety of items to use for the lesson. Some ideas might be golf ball, ping pong ball, ball of clay or play dough, keys, coins, piece of wood, plastic container, empty water bottle, filled water bottle, bar of soap, metal spoon, plastic spoon, sponge, rock, rubber band, pencil, popsicle stick, aluminum foil. You may find that you add more things to the list in the middle of the lesson! Wear a bathing suit or clothes that you will not mind getting wet. Say, “Today we are going to play in the water and discover what things float and what things sink. Did you know that scientists and engineers have to know what things float and sink when they are designing boats and airplanes?" 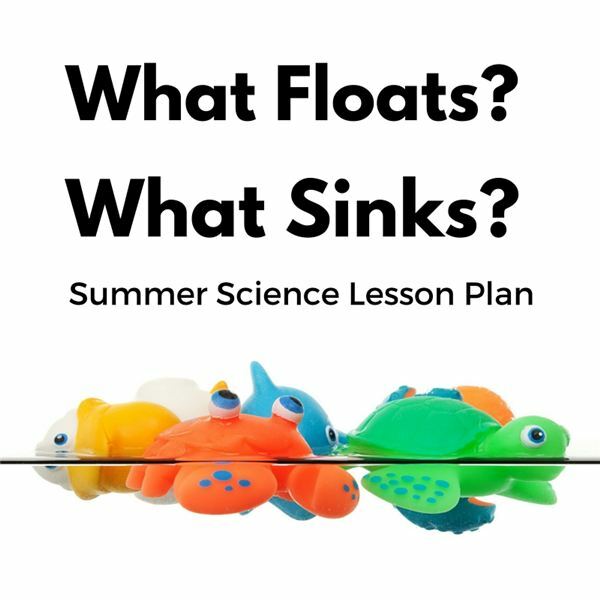 With each item, discuss with the child or children if it will sink or float before placing it in the water and the reasoning behind the answer. Record guesses in the notebook and then record what actually happened. Here are some ideas to discuss. Say, “It seems that big things should sink and small things should float but that is not always true. Can you find a big thing that floats and a small thing that sinks?" “Do you think if we changed the shape of something it will make a difference? What will happen if we take the ball of clay and flatten it out like a pancake?" “How many things can you place in the plastic container before it will sink?" “Place a balloon, ball or piece of wood in the water. They float. Gently push down on the object. Can you feel it pushing back on your hand? You may be able to push it down to the bottom but it will pop up to the top of the water! This is called buoyancy. It is the upward force of the water. Buoyancy helps support people and things in the water. It helps you float when you are swimming. It is important to know when designing a boat." “Can you find two items that are the same size but different weights? An example might be a golf ball and Ping-Pong ball or a plastic poker chip and a coin. Do they both float even when they are the same size? No. That’s because they have different densities." Let the lesson go where your child or children take it. The time will pass quickly and it will be the coolest science lesson of the summer.